Just like Mona Lisa’s enigmatic smile, I just knew there had to be something behind Henry’s mysteriously cheeky smile. 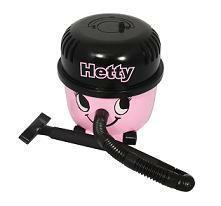 Turns out it was his vacuuming lady friend Hetty. Now you can have your very own miniature vacuum cleaning couple, and put them together so they can stare at each other with those adorably flirty eyes. Or you could be crueller than that by purchasing one and keeping them apart. Whatever you decide, Henry’s girlfriend is more than happy to eradicate all that keyboard crumbage and all the other things lurking in the crevices of your keyboard for you. Just stick in two AA batteries and get a’ vacuuming. Big Henry hit the headlines earlier this year when a builder thought it’d be a good idea to get a bit promiscuous and do some immoral and unspeakable things with poor Henry that has no doubt had him in therapy sessions ever since. Luckily, his miniature desktop sibling and his lady friend haven’t been violated in such a way to wipe that infamous smile of their faces.